You’ve completed the Author Awakening Adventure. Not only is your writing flickering to life, but parts of you that have been dormant, neglected or forgotten are shimmering too. Isn’t awakening awesome? You want to write your book. You know why you want to write it. You understand what it’s going to take … but without ongoing support, you’re afraid you won’t get there on your own. Perhaps you’re ready for the Write Your First Draft Masterclass. This is an exclusive membership limited to 24 people who have completed the Author Awakening Adventure. The aim is to support you to complete your first draft within 12 months in a community of supportive emerging authors just like you. What are the benefits of membership to the WYFD Masterclass? other exclusive offers available only to members of this Masterclass. With courage, curiosity and a suitcase of dreams, I stepped into this journey. Steered by guide extraordinaire, Joanne, I have ventured through memories, and beyond my wildest imagination — to this space; where the currency of exchange is unconditional love, and home is a community of gentle wisdom. This course has transformed me and my writing. Joanne offers insight and motivation into the art and craft of writing. Although I am not as active in the Facebook group, she is an active participant, constantly sharing encouragement and guidance with those who are. Each monthly module builds on the previous one, challenging us to do better and be better, not just as writers, but as people, pushing us to experience, and express, life more deeply. I often feel as if Joanne can read my mind, for every time I wonder what I should do next to improve my writing, the module provides me the answer. Joanne’s teaching and mentorship of the writing process awakened a deep sense of who I am, and who I was always meant to be. Her knowledge of the writing craft is exemplary, but her compassion and awareness for the personal journey we bring to our own writing, makes her classes unique, inspiring and life-changing. The masterclass experience has quite literally, changed my life. When life gets in the way you need friends who’ve got your back and keep you accountable. I thought the most important, fun and soul fulfilling part of the class was going to be me writing. Yeah, no, I got it wrong. Being part of a little group or pod and chatting with them keeps me going, keeps my creativity alive and brightens and fills my days with joy. You have a growing word count, you are beginning to glimpse your own unique writing voice, the skeleton of your book is slowly articulating itself, bone by bone. You have immersed yourself in your writing life for eight weeks, you have a community where you are safe to share and ask questions. You know all those things Joanne promised in the AAA prospectus presented themselves during the eight weeks, just bigger and better, and at a deeper level than you could possibly have imagined, and you can see the value of a mentor who is committed to holding a space for you to gestate and birth, and bring up your book. You’ve been to kindergarten, you’ve done school. Here’s your chance to go to university. If you want to do this thing, if you want to write, be a writer who sends something out into the world in service and gratitude, then do it. Follow through. There is never going to be a better time than right now. 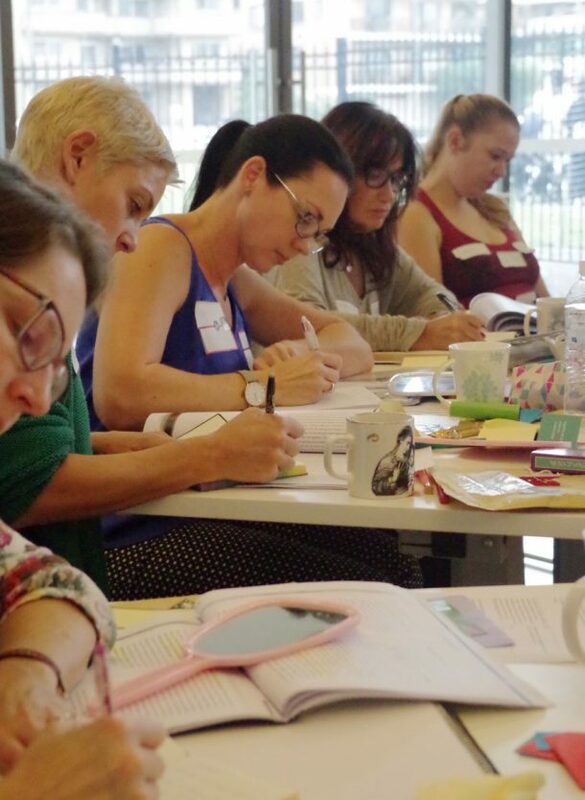 The WYFD will offer you practical craft lessons and support, the space to grow your personal and writer’s consciousness, a pod of your peers to support you on a day to day basis, and a mentor who is fully invested, and brings an energy of abundance and kindness to her teaching. Being part of a team is so much easier than slogging along on your own. This is a spectacular team. Come on, do it, it was my best writing decision, and it will be yours too. I knew 2018 would be the year of change, I also knew it would be the year of my book. After the AAA, I jumped at the opportunity to work with Joanne a little longer. Her sensabilities appealed to me and I really enjoyed her no nonsense approach to committing to the writing process. So, I did. I wrote, and I am still writing and by the end of this year, there will be a book to show for it. A tragic first draft. And wether that draft turns into an actual book is besides the point, the fact is, without the gentle nudge from Joanne, it would still be a dream on the bookshelf of my mind. I was trepidatious at the beginning of WYFD Masterclass, but slowly I leaned into trusting myself more, listening to the song of my own story taking place and experimenting with the way of my words. Allowing myself the time to journey through this process of my inner landscape, all with the guiding hand of Joanne, and the ever present support of my writing pod. Both invaluable tools of guidance. Deciding to leap into the WYFDM after the AAA, when I most wanted to hold on and most afraid that the funds would not be there, I had faith, because why else was I on this path? It has been the best decision I have made in regards to writing my book. The AAA gifted me with an amazing shift in my consciousness. I am a psychotherapist and the AAA deepened my understanding of myself that I had not encountered in some of my other times in therapeutic conversations. Buying in to the WYFD was more about continuing to grow my consciousness than to necessarily write a book. A published book would be a bonus, however. The craft part of both the AAA and WYFD are also a bonus. I have now committed to writing a book and that is forming part of my catharsis too. I have a very busy life and cannot always keep to a schedule when it comes to writing. The writing pods we have been divided into provide an oasis of accountability and were it not for my pod, I would not be writing, albeit sporadically. The financial investment is high, but I am worth it. The financial investment is high but Joanne always over delivers and that financial investment has now become a bargain. Trust your heart in your decision. I did.